Ready for the ultimate “want to feel old” moment? The Little Mermaid, everyone’s favorite underwater adventure, is officially 30 years old this year. We know. The film first came out in November of 1989, and to celebrate three decades of Ariel, Sebastian, and of course, Prince Eric, plus-size fashion retailer Torrid (who blessed us with Harry Potter and Sailor Moon collections in the past) has partnered with Her Universe to launch a collection celebrating the Disney classic. Comprised of 16 pieces, including leggings, dresses, pajamas, and swimwear, the Torrid x The Little Mermaid collection is equal parts nostalgic and modern. Mermaids are having a moment right now, after all. So if you love the mermaid trend, and collect all things scaly and underwater-themed, this line is definitely for you. 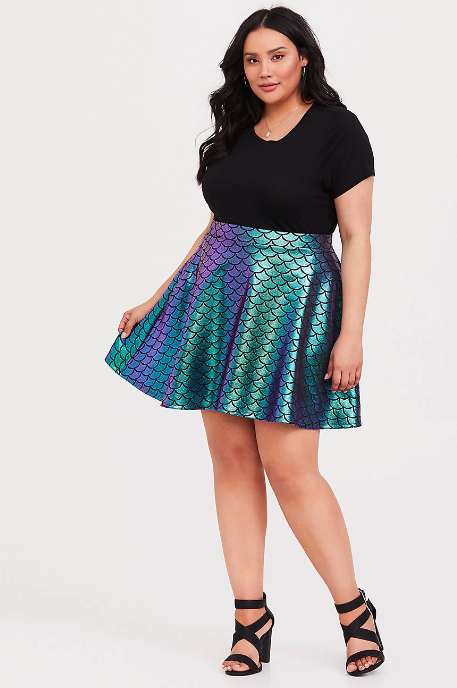 Launching today, March 21st, the Torrid x The Little Mermaid collection features a scaled holographic skirt, tentacle-adorned leggings, an Ariel sweater complete with pearl accents, and more. Sizes start at 10 and go up to size 30, and everything is under $70. Shop some of our favorites from the collaboration below. Inspired by Ariel herself, and her famous purple bikini top. A subtle but stunning tribute to our sea princess. If you look closely, you’ll see that this isn’t a regular floral dress. In between the flowers are dozens of mini Ariels. For when you want to take the sea vibe to bed.